This beach at Carlyon Bay is the only one in St Austell and one of the best on Cornwall's south coast. The beach was part of the Carlyon Estate and therefore privately owned. In the 1930s one small part of it was built on - a sports club and lido. Decades later that became the entertainment complex called the Cornwall Coliseum. The Cornwall Coliseum hosted concerts by the biggest names of the 1970s, 80s and 90s, from Shirley Bassey to Tom Jones to Status Quo - as well as staging exhibitions and sports events. The nightclub, variously called Bentley's, Quasars and Gossips, brought people from all over Cornwall. The Coliseum and Wimpey café in 2014. After it was bought by developers in 2004, the beach and the Coliseum complex was partially wrecked - leaving this terrible mess. 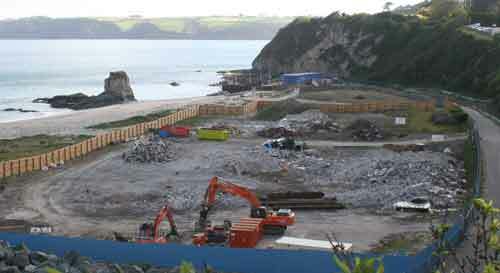 CEG received outline planning permission in 2011 for 511 apartments and villas, retail and leisure units as well as sea defences. Not a brick was laid - CEG blamed the economic climate. This You Tube video shows one local's view - it contains strong language. Visitors were greeted by the wrecked buildings as well as piles of steel shuttering and massive boulders (parts of a previous sea defence scheme erected without planning permission in 2004). In 2013 a Facebook campaign led to a demonstration by around 60 local residents calling for the mess to be cleared up so that the beaches could be enjoyed. Two petitions, one set up by Carlyon Bay Watch, attracted nearly 6,000 signatures (our thanks to those who supported them). Still nothing was done - CEG said it would cost too much and they wouldn't clear the site until they needed to. Now CEG says construction will start in 2016 and, at last, demolition has begun. The old Wimpey building was the first to be flattened in March 2015. Amid great fanfare, on 15th April 2015 work began to demolish the Coliseum itself. Local radio and TV chronicled the venue's heyday and the nostalgia of those who had used the building over the decades. 24 hours later - not much has gone yet. The ticket office and entrance area is rubble - Gossips looks to be next. "20th April - the nightclub section is nearly gone. 23rd April - after a weekend break. 24th April - one corner of the Coliseum has gone. Vegetation can be seen growing inside after so many years of neglect. By the 28th April the back of the building is disappearing. 29th April - a lot has gone since yesterday - half the building. 7th May - one day's work and the rest of the building has gone. 12th May - site clearance is well under way.